Reports are surfacing in Bermuda that government officials are contemplating constructing a pier in St Georges Bermuda. The pier will be long enough to handle the large new generation of cruise ships. Currently Bermuda only has 2 piers at the Dockyard capable of large ships.The Dockyard is a short ferry ride from the country's capital of Hamilton Bermuda - where the ships docked previously. St. Georges, Bermuda is capable of handling 2-Mid-sized ships simultaneously but the entry to the port is too narrow for the larger, wider ships to pass through. Currently St. Georges has less than 5 ship calls per year and most shops have closed since few passengers travel from the Dockyard to the other end of the island. Under consideration for the new pier is the deep water location near Murray’s Anchorage area. The new port facilities at St. Georges is supposed to be decided upon in early in 2013. 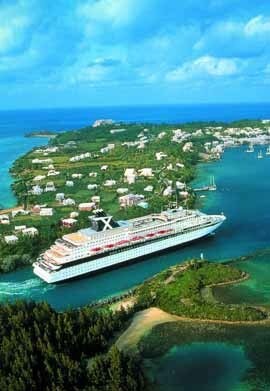 The Bermuda Government is partnering with a unspecified cruise line, to develop the port. 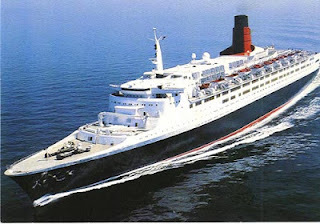 Reports out of Dubai indicate that Cunard's ex famed Queen Elizabeth 2 of 1967 has been once again sold. The ship was famous for sailing transatlantic from New York to England for much of her career. The ship was originally sold to Dubai investors in 2008, who intended to convert ths ship into an attraction and world class hotel. When financial troubles hit Dubai the ship laid idle - only being used on rare occassions - such as a venue for a 2011/12 New Years' Eve party. The ship was originally purchased by Dubai investors for $100 Million Dollars, has now been reportedly sold for $32.4 Million Dollars. Reportedly purchased by Southeast Asian buyers - it is unclear what further plans lay in her future although some speculate she may have been sold to scrappers. For the ultimate in sun and fun, Norwegian Cruise Line today announced its deployment for the fall and winter 2014/2015 season with eight contemporary ships sailing to the Caribbean and Bahamas & Florida from five homeports: Miami, New York, Tampa, Houston and New Orleans. Norwegian Getaway, Norwegian Epic and Norwegian Pearl will set sail from Miami. Norwegian Breakaway and Norwegian Gem will continue to depart from New York. Norwegian Sun debuts in Tampa while Norwegian Dawn will be introduced to New Orleans. As previously announced, Norwegian Jewel will set sail from Houston. The line will also increase its seven-day Mexican Riviera sailings from Los Angeles and a series of Panama Canal voyages between Los Angeles and Miami. All of these cruises go on sale today, December 18, 2012 and can be booked in conjunction with the line’s “The Upgrade Wave” sales event. From New York, Norwegian Breakaway will sail a series of seven-day Bahamas & Florida itineraries from her year-round home port of New York City from October 5, 2014 to December 28, 2014 and from February 15, 2015 through April 9, 2015. New York’s ship will also sail three 12-day Southern Caribbean cruises on January 4, 2015; January 18, 2015; and February 1, 2015 with stops in San Juan, Puerto Rico; St. Thomas, U.S. Virgin Islands; Philipsburg, St. Maarten; Castries, St. Lucia; Bridgetown, Barbados; and Basseterre, St. Kitts. 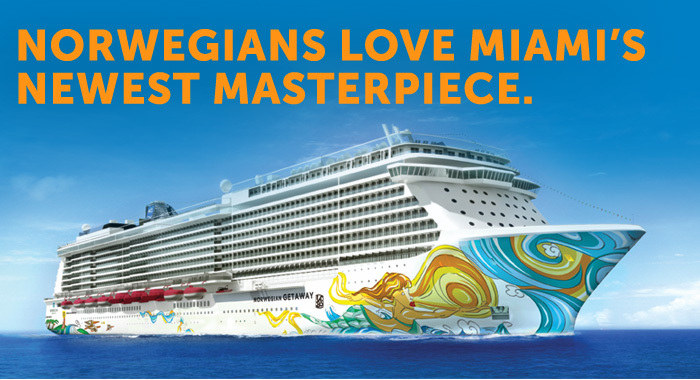 Norwegian Gem will continue to sail from New York offering nine-day Eastern Caribbean cruises from October 18, 2014 through April 15, 2015 with stops in San Juan, Puerto Rico; Philipsburg, St. Maarten; St. Thomas, US Virgin Islands; and Tortola, British Virgin Islands, along with four relaxing days at sea. The ship will also offer one-night cruises from New York throughout 2014 and 2015. For fall foliage viewing at its best, Norwegian Dawn will embark on four Canada & New England itineraries between Boston and Quebec from September 12 through October 3, 2014. These sailings can also be combined for an ultimate 14-day Canada & New England experience. Norwegian Gem will offer a series of five seven-day Canada & New England cruises from New York beginning September 13 through October 11, 2014. Ports of call include: Halifax, Nova Scotia; Saint John, New Brunswick; Bar Harbor, Maine; Boston, Massachusetts; and Newport, Rhode Island. 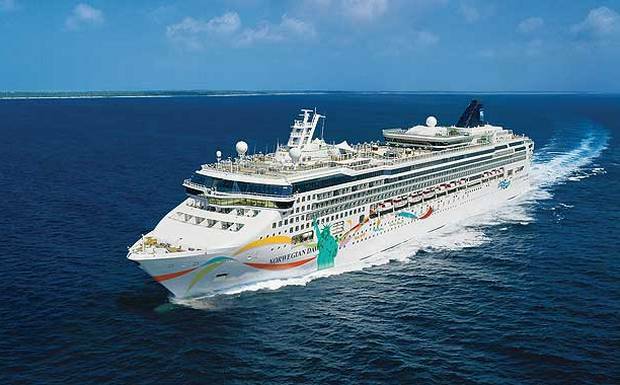 Norwegian Dawn will reposition from Tampa to Boston on April 27, 2014 and sail a 12-day Caribbean Escape with stops in George Town, Grand Cayman; Oranjestad, Aruba; Willemstad, Curacao; Philipsburg, St. Maarten; and St. Thomas, U.S. Virgin Islands. On November 7, 2014, Norwegian Dawn will reposition from Boston to New Orleans and sail a 14-day Caribbean Escape with ports of call to include San Juan, Puerto Rico; Willemstad, Curacao; Oranjestad, Aruba; Ocho Rios, Jamaica; George Town, Grand Cayman; and Cozumel, Mexico. Norwegian Cruise Line is the innovator in cruise travel with a 46-year history of breaking the boundaries of traditional cruising, most notably with the introduction of Freestyle Cruising which revolutionized the industry by giving guests more freedom and flexibility. Today, Norwegian invites guests to “Cruise Like a Norwegian” on one of 11 purpose-built Freestyle Cruising ships, providing guests the opportunity to enjoy a relaxed cruise vacation on some of the newest and most contemporary ships at sea. Engaged couples can now experience the romance of being joined at sea by the Captain aboard a Royal Caribbean International ship through the Royal Romance weddings and vow renewal program. The Commonwealth of the Bahamas has cleared the cruise line to conduct legal weddings aboard the world’s most innovative cruise ships while they are at sea. A Royal Caribbean ship is an ideal option for a ‘multi-destination’ wedding, able to cater to large parties, attended by family members and friends, to smaller – but still unforgettable – affairs. Couples wishing to share this special moment with friends and family can enjoy the Sweethearts at Sea promotional offer, inclusive of a ceremony performed by the Captain, photography and more, when booking 12 or more staterooms on a 2013 Royal Caribbean International sailing during the special introductory offer. The Royal Romance team of wedding specialists are poised to assist couples during this momentous occasion in their lives and are eager to help create a beautifully personalized event that reflects the bride and groom’s desires. From day one, the Royal Romance team assists in wedding planning services, including any legal requirements pre-departure, and once onboard, the Royal Romance Coordinator ensures every last detail is taken care of for the special moment. Brides and grooms looking to marry onboard a Royal Caribbean ship will be married in a manner that is legally recognized by the Bahamas through the newly passed Marriage Act. The act allows for marriages while in international waters, which is defined as outside the 12-mile limit of the territorial waters of any nation. The actual location of the ship when the marriage takes place is then recorded in the Marriage Record book of the Bahamas. Couples have several customizable Royal Romance Package options that celebrate their big day and include all the essentials for creating the perfect wedding. For example, the Royal Romance at Sea package includes: the ceremony performed by the ship’s captain, a groom’s boutonniere, a rose bouquet for the bride, freshly-made cake, recorded music and a live soloist during ceremony, wine at the ceremony, dinner for the bride and groom at an onboard specialty restaurant, photography services, plus champagne and strawberries in the couple’s stateroom. The Sweethearts at Seas promotion offers couples a complimentary Romance at Sea package when they share their happy memories with family and friends and their wedding party books 12 or more staterooms on a 2013 cruise of five nights or longer. Those couples booking 25 or more staterooms can enjoy the above, plus a complimentary stateroom upgrade, bar service and an hors d’oeuvres reception. Royal Romance also offers vow renewal packages, symbolic services and customized proposal packages. Complementing Royal Romance’s packages is Royal Caribbean’s Honeymoon Registry which continues the romance with friends and family contributing to a couple’s ideal Royal Caribbean honeymoon cruise. Instead of the standard pots and pans, the couple’s family and friends can contribute to a dinner at a specialty restaurant, a couple’s massage, or an excursion. Couples can add all of the onboard activities they’d like in the registry, where their family and friends can even contribute to the cruise fare and help make the dream of vacationing to far-off places a reality. The Sweethearts at Seas is now available to be booked for cruises starting January 1, 2013. For more information about the Royal Romance Program contact your preferred travel agent, visit Royal Caribbean at www.RoyalCaribbean.com/weddings or call 888-WED-RCCL (888-933-7225). When a Celebrity Cruises Gift Card is purchased during the month of December, the modern luxury brand will double the value up to $500 when the card is used to purchase a cruise by January 31, 2013. With more than 450 sailings to choose from, featuring destinations around the world, Celebrity Cruises offers something for everyone on consumers’ gift lists, whether it’s Caribbean island hopping, plying the historic waters of the Old World, adventure-seeking Down Under or taking in the sheer majesty of Alaska. While onboard, guests will be immersed in a world of modern luxury with fine dining options, premium spa amenities, exciting entertainment and unrivaled service that will leave them fully relaxed and restored. Gift-givers can help friends and family make the most of their precious vacation time, or their own, by taking advantage of this extraordinary offer by buying a Celebrity Cruises Gift Card by December 31, 2012. Celebrity Cruises will match up to $200 for a booking on four- to seven-night sailings, and up to $500 for booking on sailings that are eight nights or longer. All itineraries are eligible, with the exceptions of transatlantic voyages and vacations on Celebrity Xpedition in the Galapagos Islands. Celebrity Cruises Gift Cards can be sent as e-Cards or delivered via standard mail. For gift cards to be delivered in time for Christmas, consumers should order by December 21, 2012. Orders can be placed by calling 1-866-225-6450, via www.celebritycruises.com/gift, or by contacting a travel agent. Carnival Cruise Line Institutes Gift Card Program. Just in time for the holidays, Carnival Cruise Lines has launched its first-ever gift card program – a pre-paid card that can be used as payment toward a “Fun Ship” vacation or a variety of shipboard purchases. Available online at www.carnivalgiftcards.com or on board Carnival’s ships, the cards are ideal for any occasion – from weddings and graduations to birthdays and anniversaries – offering consumers flexibility and convenience in their vacation purchases. The cards can be pre-loaded with funds ranging from a minimum of $10 to a maximum of $1,000. The Carnival Gift Card is simple to use – it may be applied online via the dedicated web site using the 16-digit card number, redeemed by calling 1-800-CARNIVAL or used like cash on board as payment toward guests’ “Sail & Sign” shipboard account. Holland America Line has dramatically increased its video library on www.hollandamerica.com with the recent addition of 325 short videos showcasing the line’s shore excursions in Alaska and select ports around the world. Featuring 275 videos on Alaska tours and 53 port overviews with shore excursion details, guests can get a glimpse of select tours before departing on a cruise and deciding which ones to book. Whether it’s a flightseeing tour in Anchorage, Alaska, or exploring the streets of Quebec City — the premium line’s top-rated port call — the videos show the beauty and diversity of each port while highlighting a particular tour. When in port, guests on a Holland America Line cruise can choose from several diverse shore excursions including Overland Adventures, off-the-beaten-track explorations, Signature Collection private-car touring and exclusive Medallion Collection excursions. Ultra-luxe Crystal Cruises is offering a bevy of innovative repositioning cruises in 2013, with new itineraries on 60% of the voyages. As year-round, worldwide cruise ships, the award-winning Crystal Symphony and Crystal Serenity usually move to different regions (i.e., “reposition”) seasonally. While repositioning cruises historically offer exceptional value, Crystal ups the ante in 2013, touting handsomely priced, reinvented journeys with unusual twists across the Atlantic, Pacific and American coastlines, from Northern to Southern Europe, North America to South America, and more. Ø Rare visit to Petropavlosk, showcasing Russian Far East culture and natural bounties such as 68 active volcanoes. Ø Crystal’s only Alaskan cruise in 2013, with four calls including lesser-visited Dutch Harbor and Kodiak, plus Seward and Ketchikan. Ø “Ocean Views” theme featuring lively debate among world affairs experts about current issues. Ø Traditional New England ports, including Newport, RI; Boston, MA; Bar Harbor, ME; Halifax, Nova Scotia; and St. John’s, Newfoundland. Ø New overnight in Reykjavik. Ø “Wine and Food” theme with guest culinary experts and complimentary classes. Ø Extended time in the world’s preeminent wine country via Bordeaux overnights. Ø Intimate southern Spain, with Barcelona overnight and Cadiz/Seville call from London, and Barcelona, Málaga, and rarely-visited Cartagena calls when sailing to London. Ø Unique UK islands: Gibraltar (Barcelona-London) and the Channel Islands (London-Barcelona). Ø Rio de Janeiro overnight. Ø Caribbean stops in Barbados and Devil’s Island, French Guiana. Ø Intimate, off-the-beaten-path Brazil, including a maiden call in Natal, plus Belém, Fortaleza, Maceió, and Salvador stops. Ø “Wine and Food” theme and extra-special culinary indulgences during U.S. Thanksgiving. LA-NY Panama Canal (May 6) with rare call to Charleston and a “Garden and Floral Design” theme offering shore excursions to local gardens across the eastern seaboard . “Trans-Atlantic” from London (Sept. 2), ending in Boston for Crystal’s first time ever, with two calls in Scotland en route. NY-Miami (Nov. 2) offering extended time in the U.S. Southeast (Charleston, Savannah, and maiden call to St. Augustine), plus Baltimore, Turks & Caicos, Curacao, Aruba and a “Film and Theatre” theme. Miami-Lisbon (March 31)—A dozen Ambassador Hosts to dance and dine with guests, 10 days across the pond, and a visit to Portugal’s Madeira Island. Barcelona-Miami (Dec. 9)—Nine luxurious sea days plus calls in the Canary Is. and St. Maarten. With all-inclusive fares for the collection starting at just $2,210/person, couples can save up to $4,000 with current “Book Now” pricing, if booked by December 28. The renowned Crystal Experience has been rated “World’s Best” more than any other cruise line, hotel, or resort in history. On December 11, 2012 Cunard Line’s Queen Victoria celebrated her fifth anniversary, as five years ago she departed on her Maiden Voyage from her homeport of Southampton – a day after being named by HRH The Duchess of Cornwall with HRH The Prince of Wales in attendance. Since then she has sailed over half a million nautical miles, called at 196 ports in 63 countries and carried almost 250,000 guests, many of whom enjoyed the experience so much that they have traveled many times with the ship already. In all, 20,300 bottles of champagne – enough to fill six Olympic-size swimming pools – have been drunk and 9,125,000 cups of tea and 1,460,000 scones have been served since 11 December 2007! To mark this special birthday, HRH The Duchess of Cornwall will make a return visit (her third in five years) to her ship on 13 December in Southampton and spend time meeting crew before unveiling a specially-commissioned portrait of herself and cutting a special birthday cake. Queen Victoria is one of the most celebrated ships to be introduced in recent years and she quickly established herself as a popular member of the Cunard fleet continuing in style the line’s traditions established 172 years ago. Now the third largest Cunard ship ever built (she was the second largest when she entered service but her sister Queen Elizabeth assumed that position when she joined the fleet in 2010) Queen Victoria has never been about size superlatives – she is about style. When the designers of Queen Victoria began to consider the ship's interior public spaces, they drew on the well-recorded and rich history of previous Cunard ocean liners to set the tone. From the ship's double and triple-height spaces - a design feature of grand liners of the past - to rooms imbued with an elegant yet understated British charm, the overall effect is both contemporary and classically historic with some exciting innovations. These include the first traditional West End-style private viewing boxes at sea in the Royal Court Theatre, the first Cunardia exhibit display at sea, housing Cunard artefacts and memorabilia and the first two-storey library at sea featuring an elegant spiral staircase. Queen Victoria made Cunard history when in December 2010 the company’s first-ever female Captain, Inger Olsen, took command. The Queen Victoria is an occasional caller at New York - Usually as part of her World Cruise or Repositioning from her West Coast deployments. Norwegian Cruise Line announced today two more New York-inspired food and beverage offerings onboard Norwegian Breakaway, the line’s newest ship: Sabrett Hot Dogs and Brooklyn Lager beer. Further enhancing the ship’s ties to New York City, its year-round homeport, these newly-announced offerings provide guests with a taste of the Big Apple at sea. Located on the Waterfront, pool deck and forward deck, three Sabrett hot dog carts will sport the brand’s iconic yellow and blue umbrellas and offer up the same all-beef frankfurters that New Yorkers have voted the #1 hot dog for more than 50 years, renowned for the famous snap! of their natural casing. The carts on Norwegian Breakaway will also include the company’s famous condiments, including mustard, sauerkraut, relish, and onions in a delicious tomato sauce, so guests can order their complimentary Sabrett hot dog “all the way” (complete with all the toppings). New York’s award-winning Brooklyn Brewery’s Brooklyn Lager beer will also be offered on Norwegian Breakaway in Uptown Bar & Grill. Lager beer in the “Vienna” style, Brooklyn Lager’s amber-gold color and firm malt center are supported by a refreshing bitterness and floral hop aroma. The aromatic qualities of the beer are enhanced by “dry-hopping”, the centuries-old practice of steeping the beer with fresh hops as it undergoes a long, cold maturation. The result is a wonderfully flavorful beer, smooth, refreshing and very versatile with food. 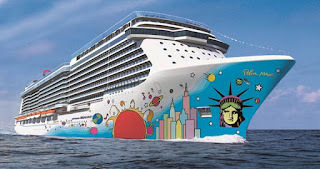 The 4,000 passenger Norwegian Breakaway will arrive in her year-round homeport of New York City in early May 2013. The ship will begin weekly summer seven-day cruises to Bermuda on Sunday, May 12, 2013. From October 2013 through April 2014, New York’s ship will offer voyages from the heart of Manhattan to the Bahamas & Florida and the Southern Caribbean. To date, the company has revealed the ship’s groundbreaking design, including The Waterfront and 678 Ocean Place; a wide range of indoor and outdoor venues on three dynamic decks that will create a whole new complex at sea that enhances guests’ connection with the ocean. Norwegian Breakaway’s entertainment will include three Broadway shows: five-time Tony nominated ROCK OF AGES; the dance sensation BURN THE FLOOR; and CIRQUE DREAMS & DINNER JUNGLE FANTASY. The famed comedy troupe The Second City, Howl at the Moon dueling pianos, and New York’s own Slam Allen will also perform on the vessel. Celebrity Chef and Food Network star Geoffrey Zakarian will also debut his first restaurant at sea on Norwegian Breakaway: Ocean Blue by Geoffrey Zakarian. The top decks of Norwegian Breakaway will feature the first Aqua Park at sea with five full-size water slides, including twin Free Fall slides, the first ever at sea, and a three-story sports complex that includes the largest ropes course at sea, a nine-hole miniature golf course, basketball court, rock climbing wall and more. The ship will also feature a rich mix of stateroom options including The Haven by Norwegian, comprised of 42 Suites at the top of the ship and 18 additional Suites located throughout the ship; the innovative Studios, designed and priced for solo travelers; the re-introduction of Oceanview staterooms, Balcony and Mini-Suites; along with Spa Balcony, Mini- Suites and Suites in close proximity to the spa. The NortheastCruiseGuide Blog provides a unique perspective and active dialog on cruises, the cruise industry, and ships sailing from New York, Boston, Baltimore, Norfolk, Quebec, and Montreal Canada. The editor of this column has over 40 years of cruise industry experience and shares his knowledge via this blog, the NYCruiseInfo.com, and the NortheastCruiseGuide.com websites. The Northeast Cruise Guide Blog is updated daily so please check back frequently. NortheastCruiseGuide.com 2012/2013. Theme images by epicurean. Powered by Blogger.